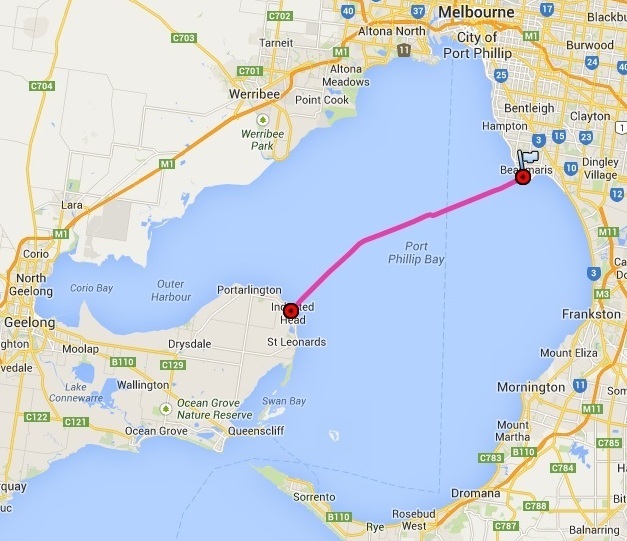 On Sunday 10 November 2013 I set off on a challenge to cross Port Phillip bay. It is 32km (straight line) between Rickett’s Point and Indented Head. This is the same distance as the English Channel. You can’t see the land at either side from the water – although you can see some mountains and higher ground further behind. I was running on a compass bearing for the first half and the high land near Portarlington before I could see the land I was aiming for. Leaving just after dawn – it took me 5.5 hours to reach the other side of the bay. I had 15 knot winds on the bow quarter which didn’t help progress. The only thing of interest on that leg was the coast guard boat that crossed within 150m of my path right in the middle of the bay. They saw me but they didn’t stop for a chat. I can’t imagine it is common for them to see a solo paddler in the middle of the bay. Perhaps they were in a hurry to rescue someone…. The winds gradually increased but it was mostly 15 knots on the port bow quarter. Waves were 1-1.5m and knocking me off course a bit but not too bad. I think the wind and waves were slowing me down – but not as bad as if I was going straight into it. I landed at an idyllic beach at indented head where it took a few moments for my wobbly legs to get working properly. I found shelter from the wind, warm sunshine, green grass and a picnic shelter. Apart from no mobile service (damn you Optus) and the toilet block being locked it was a very pleasant lunch break. The Westpac Rescue helicopter was doing training exercises nearby away and winching people out of the water. Reassuring to know these guys are around. Then at 1pm I jumped back into my trusty kayak and set course for Rickett’s point – although my bearing did not make sufficient allowance for the northerly drift I would experience as a result of the wind & waves. I had 15-20knots on the Starboard beam for most of the trip. About half way back I could see Rickett’s Point and realised I would need to head slightly upwind to make landfall at the car. I was looking OK but with a few km to go from shore I could battle the wind no longer. I decided to run with the waves and go ashore at Half Moon Bay (where the Cerberus wreck is). I called Mrs B who kindly came to pick me up. G-Man also came down and thankfully helped me load up the kayak and gear as I was shagged by this stage. The return leg had a bit more shipping activity in the North-South Shipping channel about 10km west of Rickett’s Point. The only drama I faced was when the tanker ‘Value’ turned to starboard unexpectedly and could have run me over had I not changed course. I am not sure why he decided to deviate from the main channel and head west all of a sudden – or whether he saw me amongst the white caps – but it was a valuable lesson about making assumptions. So it was a tough day – with 11 hours on the water but it provided me valuable experience and training for Bass Strait. I can’t say that I recommend the trip but glad I can cross it off my list. Crossing the bay one way on a calm day with a few friends…..that could be fun! I found out later that some kayakers had run into trouble near Williamstown that day so I was glad I didn’t end up on the news. Sounds like a great training paddle for Bass Strait.